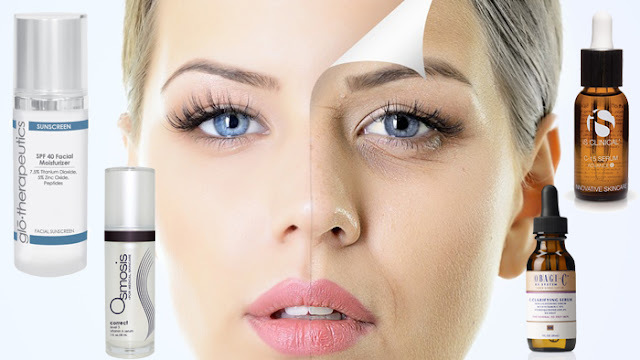 Looking for products that target your aging skin can be quite overwhelming. There are a ton of creams, cleansers, serums, and sprays that all claim to be regular fountains of youth. You may find yourself wondering where to start in your battle against time. The number one anti-aging product is sunscreen. It is crucial to wear sunscreen every single day. Daily use of sunscreen reduces photo-aging and slows the development of wrinkles and sagging skin. The gloTherapeutics SPF 40 Facial Moisturizer is one of my favorite daily sunscreens. This facial sunscreen provides broad-spectrum protection from the sun’s damaging rays while nourishing hydrators and antioxidants fortify the skin. Vitamin C is a powerful antioxidant that not only protects your skin from environmental damage and prevents the formation of free radicals, but it also provides your skin with the components necessary for collagen production. When used as part of a daily regimen, it helps create firm, younger looking skin while reducing the appearance of sun damage and red marks. It's best to use this in the morning along with your sunscreen since it's been known to increase the effectiveness of sunscreen. iS Clinical C-15 Serum Advance contains a powerful 15% concentration of scientifically-advanced stabilized vitamin C (L-ascorbic acid), the optimal dosage for balancing maximum efficacy with minimal irritation. With daily use, it's been proven to even skin tone to help control the visible signs of aging. Topical Vitamin A comes in a few different forms. The most common forms are retinol, retinyl palmitate, and retinylaldehyde. When applied topically, Vitamin A promotes cell turnover, stimulates collagen production, and dramatically reduces wrinkles by smoothing out your skin. It's best to use this product at night because it has the potential to make your skin sensitive to sunlight. Osmosis Correct Vitamin A Serum is specially formulated to set up the ideal environment for aging skin to remodel itself through increased skin nutrients, collagen production and elasticity. Now that you know the top three defenders against aging skin, it's smooth sailing from here. Sit back, relax, and let your skin repair itself. Remember, beauty is ageless! Contact our beauty experts with any questions or needs at customerservice@beautystoredepot.com!